Marijuana businesses are increasingly expanding into CBD products derived from hemp, capitalizing on the hemp industry’s growth and less restrictive legal status. The diversification allows cannabis-infused product companies, in particular, to expand their geographic sales reach, bolster profits and boost brand recognition. Hemp-derived products don’t face the same restrictions as those containing THC, giving marijuana-infused products manufacturers the opportunity to expand their offerings and sell in new states. “If you want to build a national brand right now as a marijuana company, one of the great ways to do that is by starting a CBD line to coincide with your THC-based product,” said Scott Giannotti, founder of the New York Cannabis and Hemp Association. He said that it’s a great way for a cannabis company to expand quickly. Cannabis entrepreneurs can take any profits they make from CBD products derived from hemp oil and reinvest them in their THC business – or vice versa – according to Giannotti. “The CBD hemp oil piece is a key piece for marijuana companies to expand in a national way and get into all 50 states, because CBD hemp oil products are very different from the CBD-only products that are regulated in other states,” he said. Similarities between marijuana and hemp have spurred companies to work in both areas. Marijuana businesses can easily apply existing production methods – namely extraction – to create low-THC, high-CBD infused products that can be sold across the United States. Both hemp and marijuana come from the cannabis plant, but hemp is a variety of the cannabis sativa plant that has been bred for industrial uses and CBD properties. Congress limits THC levels in hemp to 0.3%. Anything higher is considered marijuana and subject to local, state and federal marijuana laws and regulations. 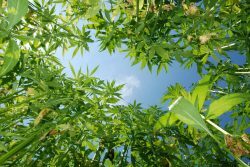 Hemp itself has benefited from rising demand for CBD products and new applications for the plant. It is used for medicines as well as products ranging from clothing to building materials. The 2014 Farm Bill authorized hemp production for research purposes and select pilot programs. While hemp cultivation was federally prohibited before the 2014 Farm Bill, hemp processing and products weren’t. The United States imports most of its hemp. Scott Leshman, based in Detroit, is among those tapping the marijuana and hemp markets. Leshman is the founder and owner of Cannabinoid Creations, a hemp-derived CBD company. He also has a medical marijuana company, Special FX Labs. Leshman is using his hemp products, particularly a CBD-infused soda, to diversify as well as expand the overall reach of his products. He started seeing more of a demand for CBD products among his customers. He had been making hemp-derived CBD products for a little over seven years, then started integrating them into his established THC-based business. Now Leshman has “a far greater reach versus just being here in Michigan,” shipping hemp-derived CBD products nationally. He has a handful of distributors in various states and is in talks with alcoholic beverage wholesalers about getting his infused soda and water placed in bars, restaurants and nightclubs in 15-20 states. Leshman sees this as a way to become more recognizable all over the country and anticipates more overlap between hemp and marijuana in the future. There’s definitely the opportunity for entrepreneurs to get into hemp “and they don’t have to worry about going to jail,” he said. Mary’s Nutritionals and Medicinals, a Denver-based infused products company, also is tapping the marijuana and hemp markets. The company’s medicinal lineup contains MMJ product – such as distillates and transdermal patches and pens – with at least 0.3% THC. Those products are available throughout Arizona, Colorado, California, Illinois, Nevada, Oregon, Vermont and Washington state. Mary’s also offers a suite of hemp-derived health products, including patches, oils and topicals. Those products are available for online purchase and delivery to all 50 states. The company’s goal is to peddle hemp-derived products in states that hadn’t legalized marijuana yet. Mary’s CBD hemp line accounts for about a third of the company’s sales. The MMJ products, meanwhile, account for about two-thirds of the company’s total revenue. Mary’s started its nutritionals brand about two years ago, and Provencio hopes those sales will climb. In Michigan, Leshman echoed that statement. Medical marijuana accounts for about 60% of his sales and hemp about 40%. The hemp number is increasing each month, however. Despite certain differences, industry officials said, the hemp and marijuana industries could help each other – particularly in the area of educating the general public about the distinctions between the two. And working together could benefit both sectors in other ways, officials said. Collaboration, for example, could lead to more established standards, a stronger voice to advocate for legalization on the federal level, and an expanded marketplace. Michael Bronstein, co-founder of the American Trade Association for Cannabis and Hemp, in Washington DC, believes the two industries need to cooperate as they expand. “Some of the same impediments we’ll see on one side of the equation will affect the other side of the equation,” he said. He also sees the necessity for a combined effort to develop regulations and laws if and when the federal government contemplates full-scale legalization of both hemp and marijuana. “If you’re on one side of the industry you’re concerned because of the regulatory confusion that has plagued both industries,” he noted. Informative article, but disappointing in its lack of mention of the DEA’s recent filing, establishing a Controlled Substances Code Number for “marihuana extract,” and asserting marijuana, hemp and their derivatives to be Schedule I substances – or of the lawsuit filed to challenge the legality thereof. While it seems to me the DEA is way out of line in this action, it nevertheless makes the legal waters considerably murkier, at least until resolution. SFX Labs have excellent products but, where can I find them in Detroit Metro area. They are getting scarce and very difficult to find. Love the Dark Chocolate Mint in the higher doses (120-180 mg packs) but only found 60 mgs and only 3 available with no clue when and IF more will come. Website not active, no company posts since 2014. So what gives?